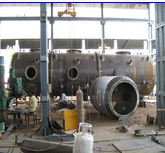 Manufacturer of pressure vessels.Originated by The Name of Sandhu Construction Company in 1962, by Sh. D.R. Sandhu with civil and general construction activities. Design, Engineering & Supply of Pressure Vessels, Heat Exchangers, Columns, Reactors, Towers, Tanks, LPG Bullets and Trolleys /Tow Cans. We are registered as 'A' Class Electrical Contractors. Transmission of 440 KV & below with HT Panel. All Civil Works such as Cable Trenches, Foundation, Building Works Etc. 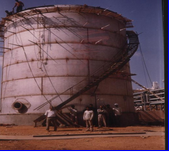 Detailed Engineering & Design of Pressure Vessels, Tankages/ Silos, Chimneys, Piping Systems, Fuel Oil Handling System, Structural Buildings/Industrial Sheds with Electrification / Lighting. Engineering, Fabrication and Erection of High Pressure, Utility, Jacketed Piping in Material of Construction like Carbon Steel, Alloy Steel, Stainless Steel, G.I., Copper, HDPE, and PVC. Mechanical/Electrical installation of Plant and Machinery and Heavy Equipments. Annual maintenance contracts and shut down jobs with industries like fertilizers & refineries. Supply of dg sets wartsila or equivalent make single or multiple units of 6 mw or smaller. Balance of plant supply, fabrication, erection including all electrical works. Transmission Lines up to 400 KV on Turnkey Basis with our Consortium Partner. Laying Poles, Conductors, Insulators, Others Fitting & Accessories. Substation Works up to 400 KV on Turnkey Basis with our Consortium Partner & Distribution Network, Switchyards etc. Annual Operation & Maintenance of Power Plants and Retro Fitting Jobs. Complete system for DG sets and Boilers including Fuel Oil Handling System, Electrical and Instrumentation, Distribution of L.V. Power and Lighting. Stone Crushing Plant - Conveyor system for Stone Crushing Plant. Paint Shops - For Automobile Industry. Fire Fighting - Complete Fire Fighting System.